ON MY FIRST GAME DRIVE with Pugdundee Safaris, I knew I was on to something good. I was in Bandhavgarh Tiger Reserve with one of Pugdundee’s top naturalists, Naresh Singh (known to everyone as Gudda). We had just stopped for a bathroom break and tea when he motioned me to hurry up and jump back in the jeep. He had heard the forest animals sounding alarm calls and the growl of a tiger. I had barely sat down when he took off like a shot, driving the Maruti Gypsy with skill and speed. Suddenly, he stopped and jumped onto his seat and pointed. Walking slowly and nonchalantly towards us out of the forest was a sub-adult male tiger. I could barely believe it. My first tiger. I had wanted to see one in the wild in India for many years … and there he was, on my very first game drive in Madhya Pradesh. It was an electrifying moment as the large tiger walked right towards us and then skirted in front of our gypsy to cross the road. We watched him for many minutes as he walked the perimeter of an open meadow. A herd of chittal (spotted deer) in the centre were on high alert, with every head pointed in the predator’s direction. Somehow, in all the excitement, I even managed to capture a video of my first tiger. 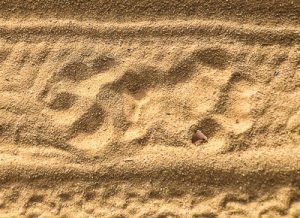 After the excitement died down, I marvelled at Gudda’s skill in knowing how to read the forest signs and the tiger’s habits, and drive skillfully to the exact spot where he emerged from the forest. It seemed like magic to me. 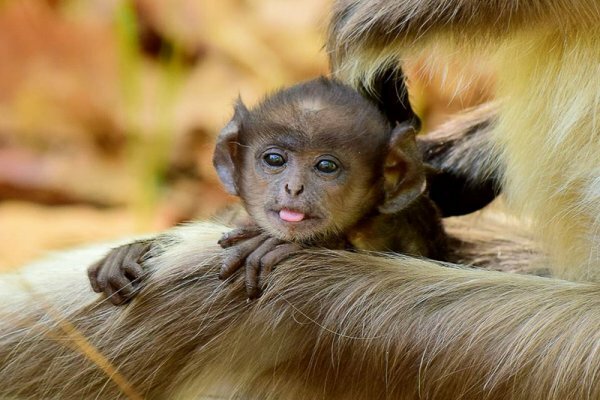 And that’s when I began to appreciate Pugdundee Safaris and their special formula for giving visitors the very best experience of wildlife viewing in central India. Back at the King’s Lodge in Bandhavgarh, I started noticing things, details about the lodge and the service. 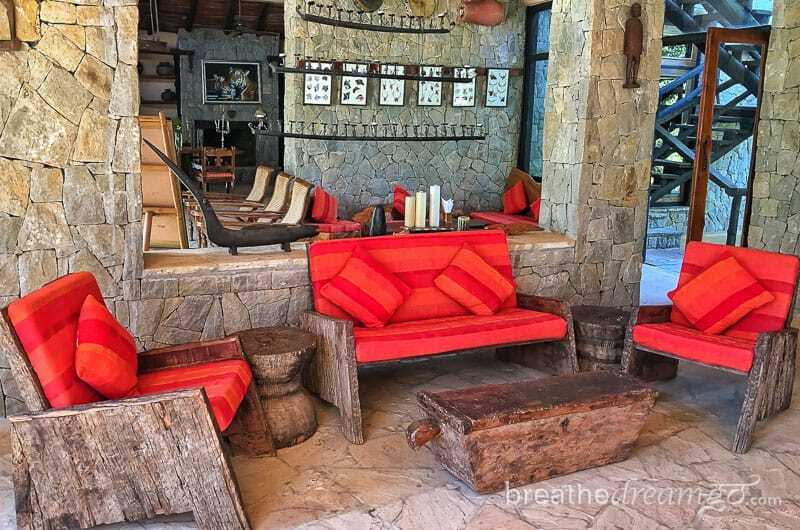 I noticed the stunning dining room, with a table made from a solid slab of teak tree. I noticed the passion with which the naturalist talked about butterflies as he gave me a tour of the vegetable and butterfly garden. I noticed the quality of the food, both tasty and healthy, all sourced from local ingredients. But most of all I noticed the dedication of the staff, their talent and training, and the genuine care with which they treated the guests. On my second night, they treated me to a feast in the forest. In a clearing on the edge of the 14-hectare property, they created a charming al fresco dining experience with a bonfire, candles and a beautifully set table. The naturalists joined us, we each had a Tiger’s Paw (warm water, rum and spices) to warm up the chilly December night, and we ate very tasty appetizers and heard tiger tales around the bonfire until dinner was served. This combination of both rustic and luxurious experiences, genuine and professional service, plus a rock solid commitment to conservation and sustainability, is what sets Pugdundee apart. When I arrived at King’s Lodge, one of the first things they did to welcome me – along with a hot towel and cool drink – was to give me a stainless steel bottle with the Pugdundee Safaris logo on it. I was then showing the “refuelling station” – a place to fill your bottle with filtered water. There are no plastic bottles at any Pugdundee Safaris lodges. In fact, I saw very little plastic of any kind. Setting lodges mostly in remote locations away from regular tourism hubs – which makes them ideal for nature walks, birding and cycling trips through the surrounding forest and villages. Creating environmentally sensitive, low-impact accommodation (through their design and use of local stone and waste wood). Engaging in conservation and community development activities, and especially looking after the needs of local people by helping to improve their ability to earn livelihoods – the key to ensuring the future of our natural habitats. At King’s Lodge Bandhavgarh I had my own cottage, one of 18 on the 14-hectare property. Perfectly decorated to capture the mood of the tiger safari experience, it also had a large bathroom, and a terrace – where I did my morning yoga practise while watching monkeys and birds play in the bamboo forest surrounding me. After several wonderful days at King’s Lodge, I moved over to Tree House Hideaway Bandhavgarh. Tree House is also comfortable, but more of an adventure in outdoor living. The tree houses are, again, both luxurious and rustic, with all the amenities you need. I particularly loved the large sliding door in the bathroom that opened onto the deck. You could virtually shower outdoors, among the trees. 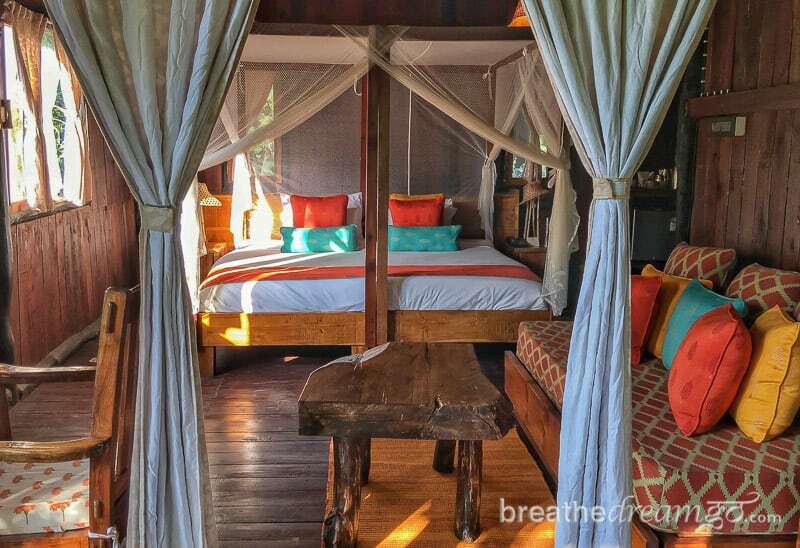 The dining room, reception and lounge at Tree House Hideaway are all built around a huge mahua tree, so you are always outdoors – though on chilly evenings they close the flaps and place metal bowls filled with hot coals beside each table. If possible, I felt the food at Tree House was even better than King’s Lodge. In fact, the food got better with each new property I visited until I hit the penultimate fare at Pench Tree House – but more about remarkable chef Pankaj later. One of the highlights of my stay at Tree House was the opportunity to borrow manager Ashish Tirkey’s Canon camera, with appropriate wildlife photography lens, when I went on a game drive with naturalist Mohan. The staff at Tree House were just as warm, welcoming and professional as at King’s Lodge – though perhaps a bit more laid back, owing to the casual environment and the youthful enthusiasm of the staff. 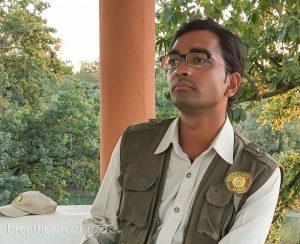 My next stop was Kanha Earth Lodge, about a four-hour drive from Bandhavgarh. Many consider Kanha Tiger Reserve to be the best in India – it’s won awards for best managed park and has a rich and varied wildlife. 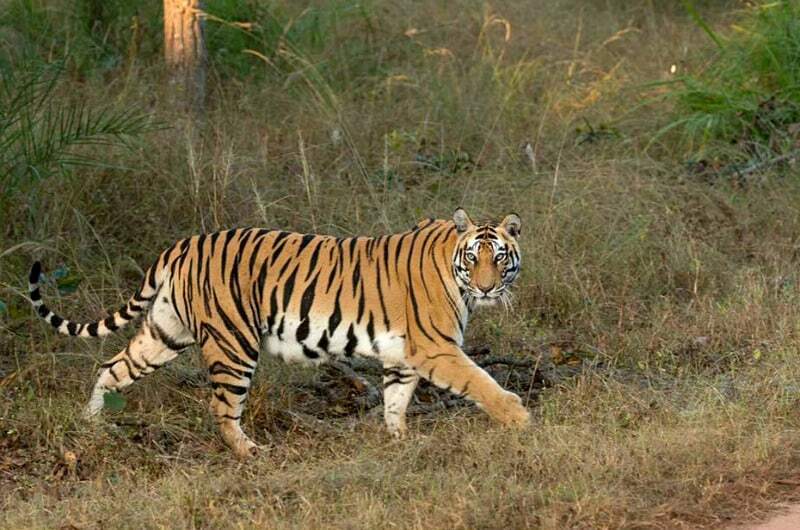 It’s also a good bet for tiger sighting, almost as good as Bandhavgarh. 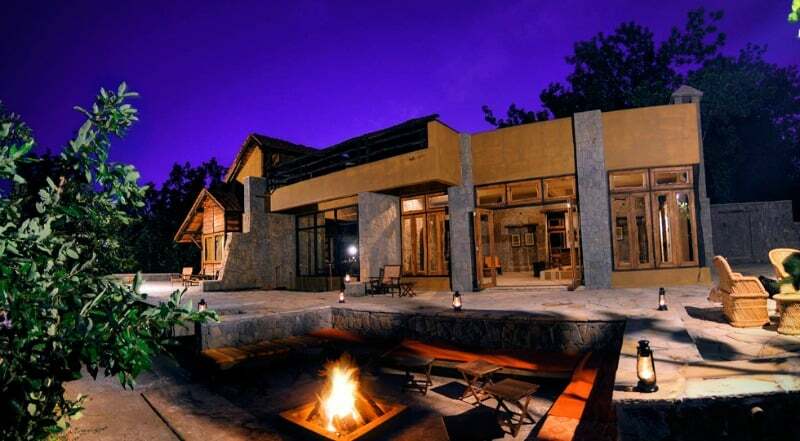 Architecturally, Kanha Earth Lodge is stunning. It’s like Frank Lloyd Wright and a talented Gond tribal designer got together to create a safari lodge. The bungalows are huge, with soaring ceiling and massive washrooms that double as change rooms. As usual, I liked the natural stone shower stall and the large verandah, overlooking the forest, best of all. The natural touches. 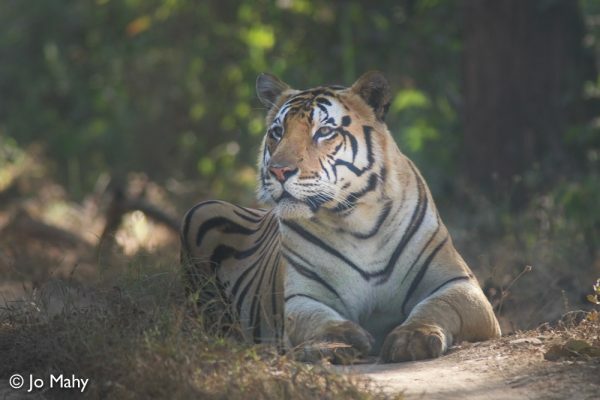 Kanha Earth Lodge is located among villages in the buffer zone, far from the main gate and all the commercial activity of this renowned tiger park. I spent a large part of the three days I was there walking through the forest and cycling among the villages with my guide Harpreet Dhillon. Seeing a huge sambar, while on foot, being invited into several spotless homes, and outdoor dinners in the forest and beside the pool were highlights. One day, Harpreet and I climbed up a hill to witness the sunset over the buffer zone. As we reached the summit, I saw a couple of people setting up a table and chairs. How smart, I thought, and asked Harpreet who they were. “Probably villagers,” he casually replied. Ha! Then I noticed they had Pugdundee uniforms on, and the table and chairs were for us! We were served chai and pakoras as we took photos of the gorgeous sunset. This is a typical Pugdundee touch. They love surprising guests with exemplary service. But Kanha Earth Lodge is not just stunning. 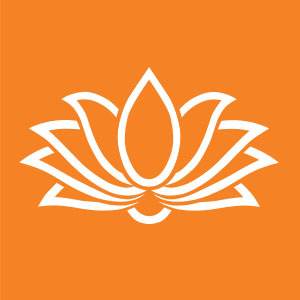 It’s also a leader in responsible tourism. I was at the Indian Responsible Tourism Summit and Awards in Delhi in January 2017 when the lodge was short-listed for Best Responsible Tourism Property. I know how rigorous the judging was. To be short-listed is virtually the same as winning. 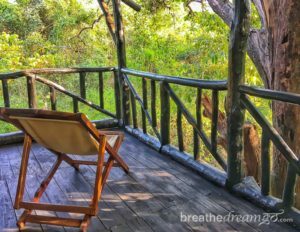 When it was time for me to leave Kanha Earth Lodge, I honestly didn’t want to go. As a largely nomadic person for six months of the year, when I find a “home,” I don’t want to leave! 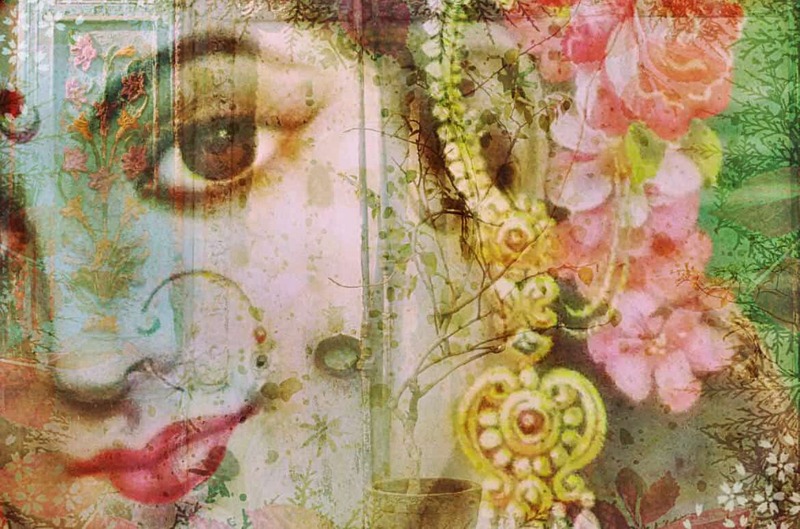 I was so warmly welcomed there, and I fell in love with the Kanha park, area, the lodge, and the people. 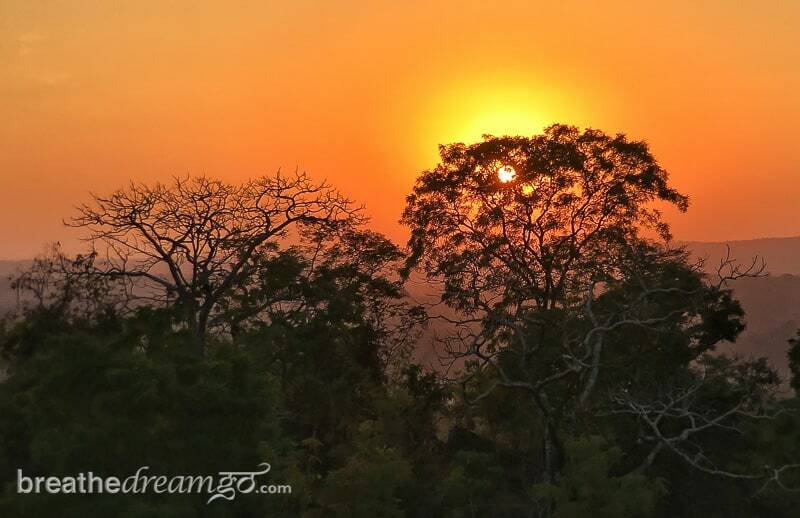 However, soon after arriving at Pench Tree Lodge I was so glad I gave it a tree. It was the last lodge on my itinerary and in some ways the best. Oh the food at Pench Tree Lodge! 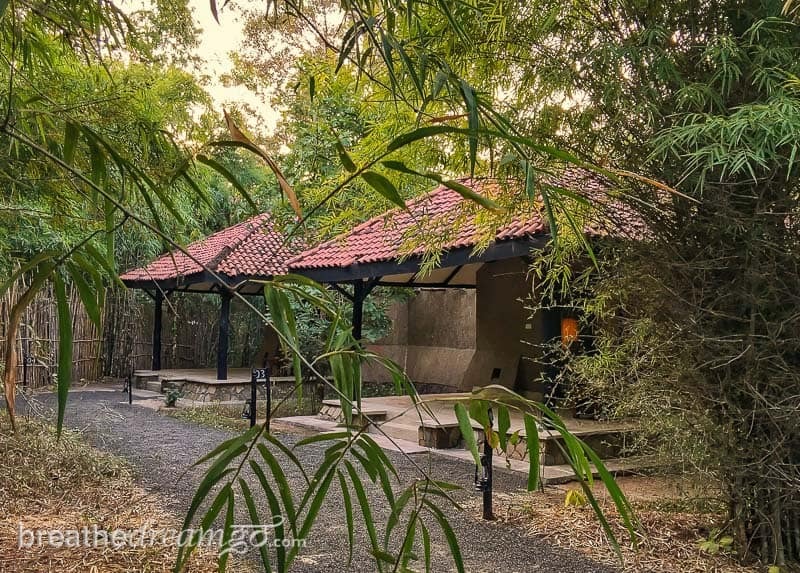 Like Kanha Earth Lodge, Pench Tree Lodge is truly in a remote area, far from the other lodges and main commercial activity of their respective tiger reserves. 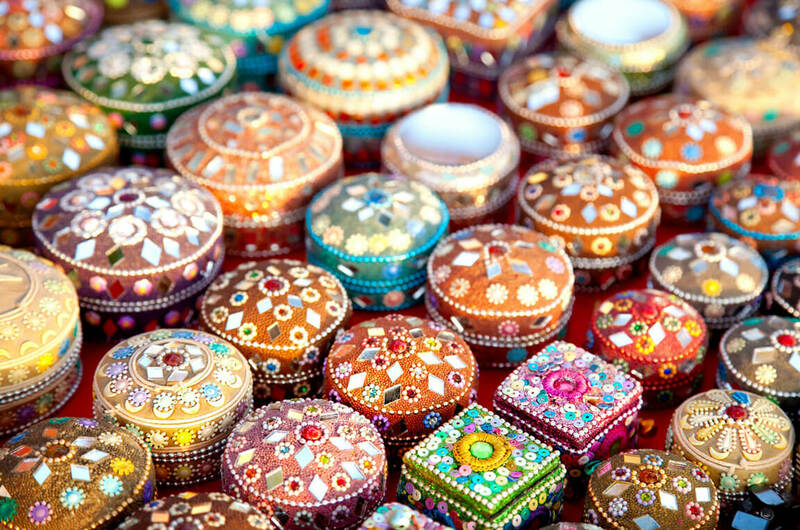 For neighbours, there are only fields, forests and some of Madhya Pradesh’s most picturesque villages. I loved the pastoral countryside around Pench Tree Lodge, and the sprawling property on which the tree houses are located. One of the main benefits of this is that you enter Pench National Park from the much lesser used Jamtara gate – which allows entry to only six gypsies. It’s very quiet and when I went, I saw an abundance of animals. 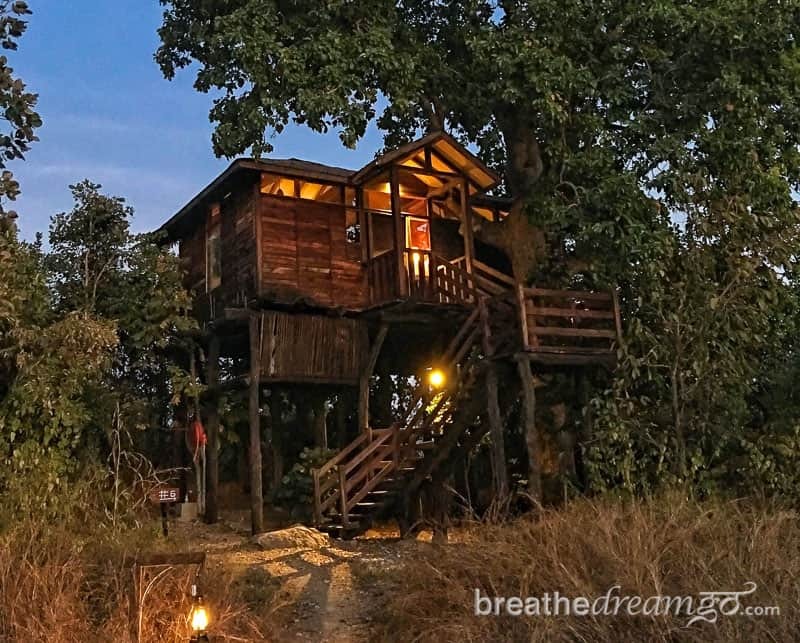 The tree houses at Pench are a notch more sophisticated than those at Bandhavgarh, as though an Italian designer had a hand in there somehow. And the lodge building too, is stylish, classy and simple with an infinity pool built into the deck. 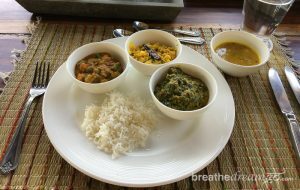 There’s so many things I loved about Pench Tree House, and spending my days with naturalist Sagar Mahajan … but I have to rank the food as at least tying for number one. I’m not a foodie, but even I know excellent food when I taste it. I’ve rarely gone into raptures tasting soup before. I could literally write an entire blog post about all the creative, fresh, healthy and tasty dishes I ate. Chef Pankaj Fulera is a star. Speaking of stars … Though I admired the stunning lodges, spacious villas and tree houses, delicious food and all the other things that make Pugdundee Safaris so special, the real stars are the people. 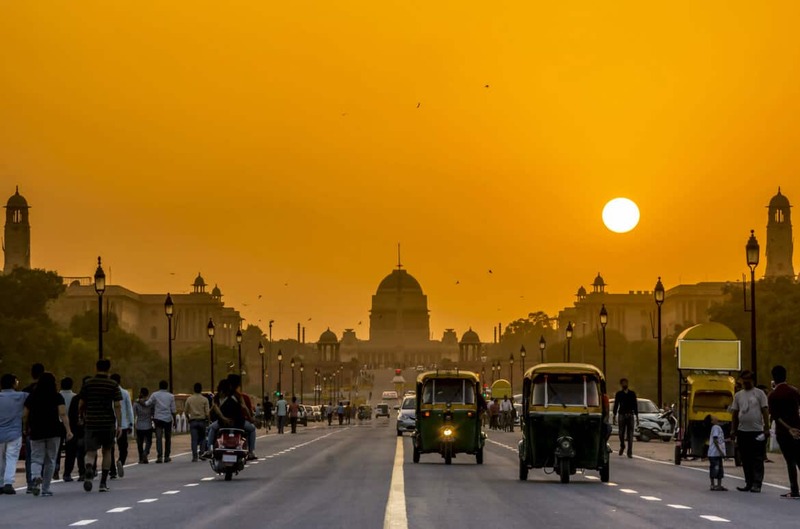 I have rarely encountered such well-trained, genuine and professional staff in India. This applies to literally everyone I met. The company obviously goes out of their way to hire the best people. But I want to highlight the three people I spent the most time with: naturalists Naresh “Gudda” Singh, Harpreet “Happy” Dhillon, and Sagar Mahajan. 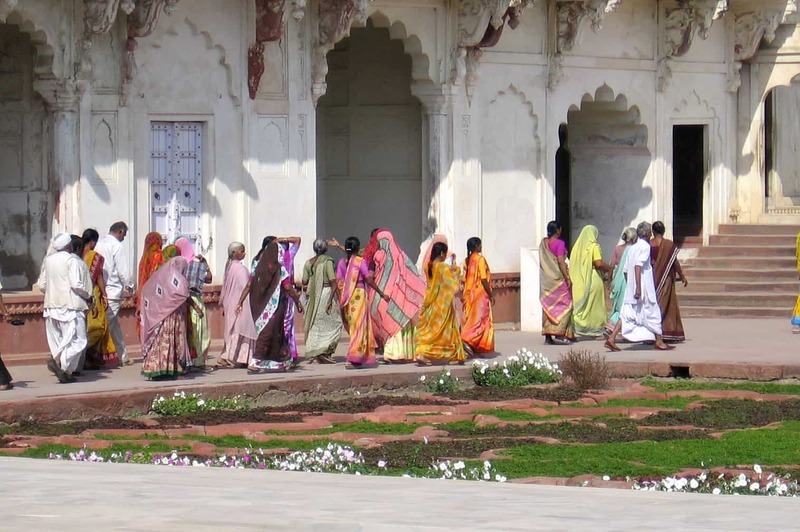 Having also been on a small group tour of the parks of Madhya Pradesh, I am in a position to fully appreciate the value these charming, smart, well-trained and English speaking naturalists bring to the Pugdundee experience. Perhaps more than anything else, being accompanied into the parks and forests by people like Gudda, Harpreet, and Sagar is Pugdundee’s most valuable asset. Naresh Gudda Singh, King’s Lodge Bandhavgarh: I think of Gudda as a modern-day and grown-up version of Mowgli. He grew up in Bandhavgarh and intimately knows the landscape, the flora and the fauna. It’s so obvious he is completely at home and comfortable in these surroundings, and his tiger tracking skills are remarkable. I saw my first tiger in the wild with Gudda and will always remember him for this amazing experience. 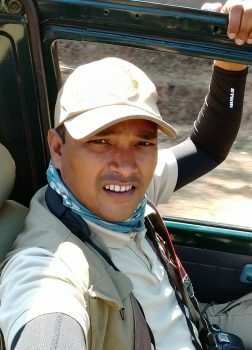 Harpreet Dhillon, Kanha Earth Lodge: Harpreet is from North India and became interested in the natural world and especially birds through his uncle, who lives near Ranthambhore and Bharatpur. He’s extremely knowledgeable, but in a quiet, charming, and relaxed way. On top of everything else, he’s an excellent photographer – and photogenic, too, as he often appears in Pugdundee ads. I had such a lovely time with him and will always remember our sunset picnic. 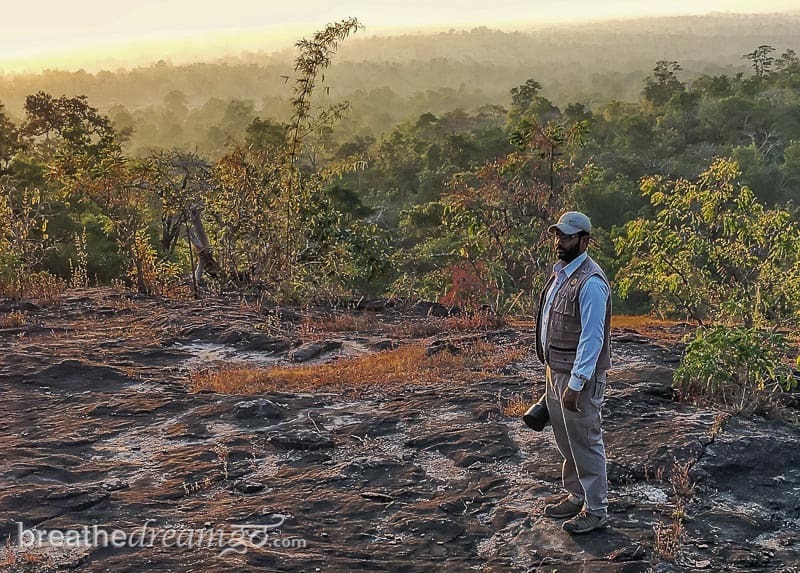 Sagar Mahajan, Pench Tree Lodge: My time with Sagar Mahajan was spent mostly in laughter. As the youngest naturalist on the team, Sagar is passionate about the natural world, and very fun to be with. We cycled through the nearby villages, and went on a game drive in the tiger reserve together. I definitely left Pench Tree Lodge with a friend. I wanted to see a tiger in the wild as much as the next person. I get it. And I was over the moon with excitement when I did. However, I do not think visitors should focus their attention solely on this goal, to the exclusion of everything else. You will miss the moment and you will make life difficult for the guides and naturalists. 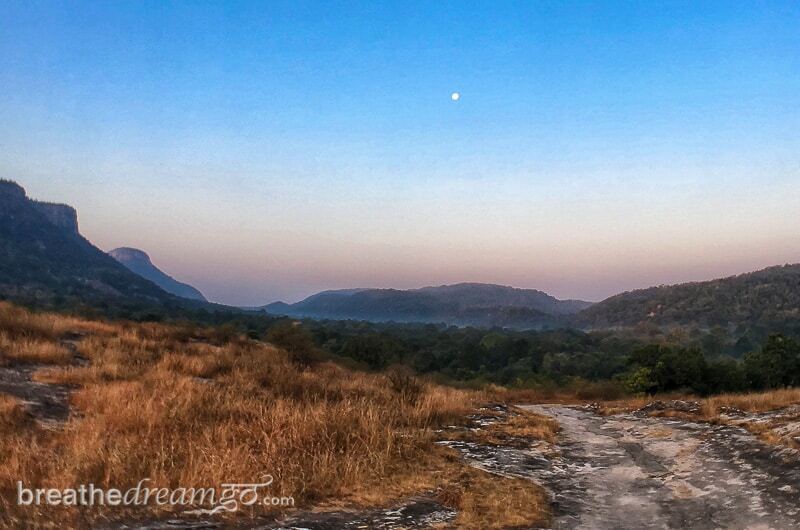 Here are my top tips for making the most of the time you spend in India’s tiger reserves. DO: Be in the moment. These parks are beautiful. Filled with an abundance of largely unspoilt landscapes and teeming with birds and animals. Take the time to just BE THERE and absorb the beauty and peacefulness. DON’T: Don’t pressure the guides and naturalists to “produce” a tiger, as if they can make them appear at will. You make their lives very difficult when you do this, destroy the peace, and miss the moment. Nature has its own rhythms and we can all gain a lot from connecting to and flowing with these rhythms — rather than trying to force and control them. I was so impressed with Pugdundee Safaris, that I am offering a tour in collaboration with them to my favourite tiger reserves in India. You can come along with me and see for yourself why seeing a tiger in the wild was one of the most amazing travel experiences of my life. I will be offering a Pugdundee Safaris tour of some of India’s top tiger reserves March 21 – April 2, 2018 (when it is starting to get hot, and the animals are easier to spot). Some of the other animals you might see include sloth bears, barasingha deer, golden jackals, and nilgai. This is going to be a very special trip. 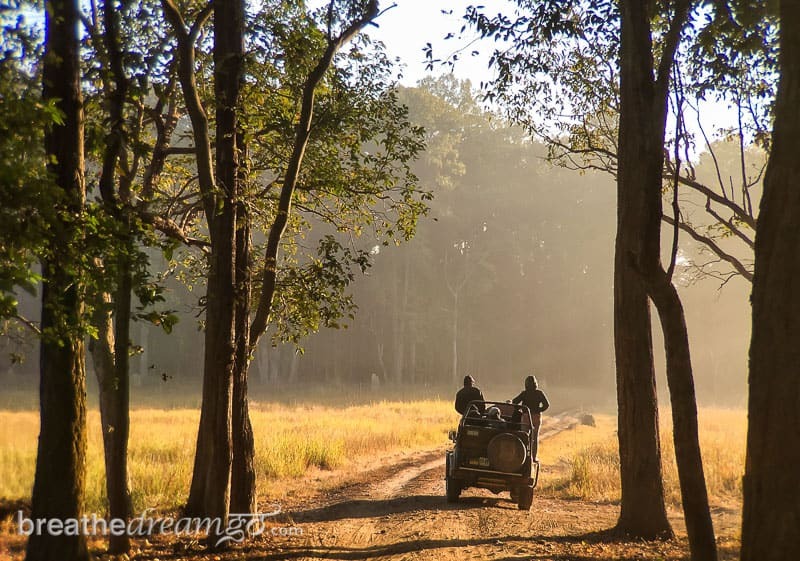 We will stay in Pugdundee Safaris award-winning lodges, be guided by their talented naturalists, enjoy delicious local foods, and take part in some very special, customized experiences – such as walking safaris, a boat ride, village visits, hiking, and one overnight camp in Satpura National Park. 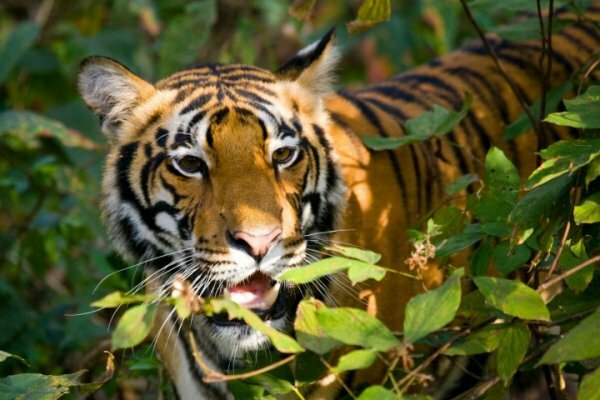 At least 8 game drives, in Bandhavgarh, Kanha, and Pench guaranteed – which means your chances of seeing a tiger are excellent. I did a similar trip and saw 11 tigers! We will need confirmed bookings on this one by end of November as the tiger reserves book up completely about three-to-four months in advance. The tour is organized and sold by Pugdundee Safaris. If you are interested in this tour, please send me and email at [email protected] with TIGERS in the subject line and I will put you on the mailing list to receive more information. It was more than the three special people I mentioned above — Gudda, Harpreet and Sagar — who made my stays at King’s Lodge, Tree House Hideaway, Kanha Earth Lodge and Pench Tree Lodge so incredible. It was everyone – the managers, the staff, the other naturalists, the waiters, the chefs … virtually everyone, and I can’t name you all. But you know who you are. Thanks to Pugdundee Safaris for hosting me at four of their lodges in Madhya Pradesh. Look for more blog posts, upcoming, about the many safaris I went on with Pugdundee, and all the amazing birds and animals I saw. Coming soon! NOTE: I was hosted by Pugdundee Safaris at their lodges in Madhya Pradesh, India. As always, my opinions are my own, my stories are heart-felt and I only make recommendations based on personal experience and with the needs of my readers in mind.